Yogi or Athlete? Can you be both? Carri talks about her 18 year battle with Plantar Fasciitis. I first got Plantar Fasciitis after starting to play soccer again as an adult. Through college I worked and went to school full time which didn’t leave a lot of room for recreational activities. As soon as I graduated from college in 1996 I jumped right into playing soccer again as if I had never left the field. I’ve always been a runner by nature of other sports I played. I played soccer and softball in elementary school, ran track (slowly) in 7th grade, then played soccer again all through high school. I almost immediately noticed the pain in my left foot, but didn’t think much of it. Funny thing about pain – if it’s there long enough you just get used to it and it becomes a part of your life. We hiked the Appalachian Trail in 1999. I was in pain and often cried at the end of 20 mile days carrying my 30 lb. pack, but of course kept on trekkin’ to the finish – all 2150 miles. We moved to Vermont in 2000 and since I wanted to do different sports I started snowboarding, snowshoeing up mountains, practicing more yoga and playing volleyball. Eventually though I started playing soccer and running again and when I did, the Plantar Fasciitis resurfaced. I was also a very aggressive player and liked playing with boys, therefore Co-ed was my poison. Co-ed indoor, in particular was fast & furious. I would come home winter nights feeling and looking more like I just played ice hockey! In the morning I would look and feel like an old woman getting out bed hobbling to the bathroom. My sister-in-law is a PA and told me “You have Plantar Fasciitis and should probably be sleeping with a night splint.” Of course I laughed at the image and never even attempted it…Flash forward to 2015 and here I am doing that very thing! About a year ago I noticed the pain again, but this time it felt different. Instead of the pain running all along the medial arch of my foot it was more like a stabbing, shooting pain in my heel – in a specific spot. I randomly ran into a Podiatrist “friend” at restaurant one night who grabbed my foot, threw off my shoe and gave me a casual impromptu exam right there at the table proclaiming “You can either stop running or have surgery.” Again, I laughed knowing neither one of those things were going to happen. Well, I can tell you I’m not laughing now. They did an X-ray and I have a heel spur! No wonder I’m in such pain. 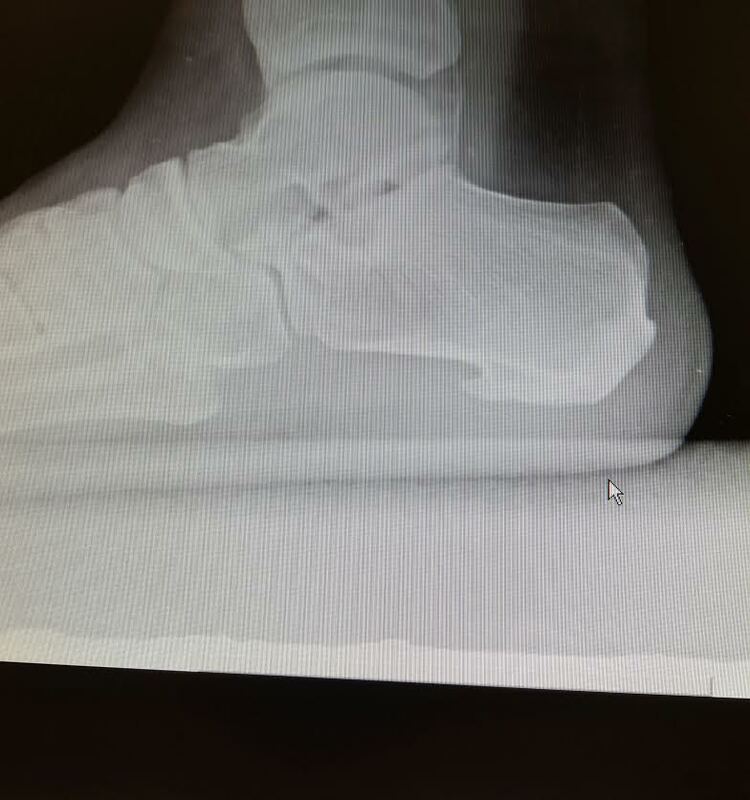 I am told the heel spur will never go away. It’s a real live bone. A calcium deposit that’s there to stay. Now it’s time to stop it’s growth, heal the damaged tissue around it and manage the pain by changing some habits. No running for 2 weeks. I may have freaked out if I didn’t have access to a gym, but my new building has one so I at least have the bikes, rower and of course you don’t technically need a gym for body weight, core and HIIT work outs anyway, right?! No Yoga for 2 weeks – we all know there’s many types of yoga and one can certainly modify. Currently I am not doing powerful, sweaty Vinyasa classes with lots of standing poses, or even casual Hatha classes with lots of standing poses for that matter. I am trying to focus more on a self Yin practice and can use this time to work on practicing my recent Yoga Nidra certification techniques. I have to sleep with a splint at night – like my sister-in-law told me to do 10 years ago! No bare feet! I literally have to wear shoes with good support around the house. This part is hard. I am used to being bare foot. Not only in yoga, and on our trainings, but for 25 years I have walked in the house and taken my shoes off at the door. My husband’s Mom lived in Japan so I got in the habit when we first started dating, plus in winter environments where we have lived for the last 15 years it just makes sense since your shoes are usually wet and dirty. It feels weird to wear shoes around the house. It feels confining, but at the same time it feels good and supportive. Besides, I can break in my new hiking boots appropriately! If I do walk long distances I need to wear good supportive shoes complete with orthotic inserts. No problem there. I wear sneakers all the time anyway and am loving my new Brooks Pure Flows. No more working on my feet all day! I recently left a retail job of working 25-30 hrs. per week on my feet. Just the simple facts of not working on my feet all day and now having a gym, mean a complete lifestyle change which will make a big difference overall! Are my running days over? I can’t imagine, but I can say I am leaning more towards self care and less towards pushing myself above and beyond. Do I really need to do the Marathon? Well …NO, but does one really need to do much of anything? It could be dangerous, but so is doing nothing. Sitting on the sofa or at the computer all day can be dangerous. If there are continual reasons why you can’t do this or that, the next thing you know you’re just not doing anything at all. If I would have honored my body I wouldn’t have finished hiking the Appalachian Trail. I wouldn’t have run a Marathon, I wouldn’t ride 100 miles on a bike. As you can see, I’m conflicted. The Woman vs. Herself conflict that has plagued me my whole life continues to live on. We shall see how it plays out. What are your thoughts? Do you experience conflicting thoughts in your Yoga practice or athletic endeavors? Read also related post about listening to your inner teacher.